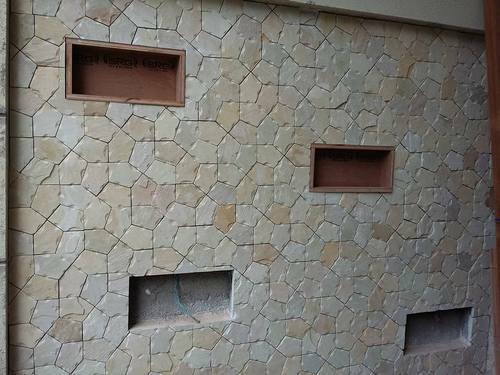 Sandstone Brick Tile, this beautiful pattern is made up of sandstone. Customers can use this product for inside and outside wall as per their choice. This Design is highly demanded by architects and designer. Random tile sizes are stacked in a repeating pattern for ease of installation. Application: Natural Stone Wall Tiles, Garden Stone Wall Stacking Tile, Dining room Back Wall Stone Panels, Natural Stone Designs, Stairs Wall Stacking, Boundary Wall Decorative Tiles. Jai Stone Export is part of the parental company Jai Stone Group which is involved in the mining, processing and manufacturing of stones since 1997. The company is driven by young family members and visionary technocrats with ample experience and entrepreneurial ability. We have our prestigious clientele in Australia, Austria, Europe, New Zealand, UK, US, CIS and they value 60% of our manufacturing. Our registered office is located at Jaipur, Rajasthan. The company has a wide variety of products ranging from natural stones to carved stone objects. The business of stone manufacturing and processing has brought us to lead a crusade of offering the best items overseas. Delivering quality products to our valuable clientele which is based in homeland India and abroad has helped us to rise and shine among the leading and renowned names related to this business. The manufacturing of stone products is being practised keeping in mind the effects upon the environment. We believe in nature and our production is based on sustainable development. Our clients are the biggest asset to us who have helped us to reach the pinnacle.